Go Wild with ZOONOOZ Online! The Sound of the Season: Jungle Bells! Sharp-eyed visitors to the Safari Park’s Nairobi Village can get a little quill, er, thrill at the Ione and Paul Harter Animal Care Center. 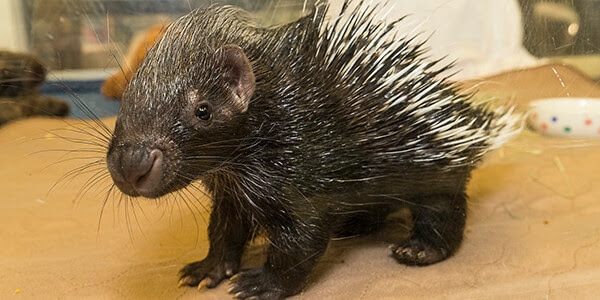 A two-month-old Cape porcupine was born on October 5 as half of a set of twins. While her mother was able to care for the little male, it seemed like she had her paws full with one baby, so the ACC staff stepped in. The adorable little girl is on exhibit in the nursery window, where she likes cuddling with her plush wombat. Keepers report that the as-yet-unnamed porcupette (yep, that’s what they’re called) has a really sweet personality and enjoys scratches. Her temperament is a plus, as she and her brother are candidates for animal ambassadorship in the future. There’s a new rock quartet at the Kopje in the Zoo’s Conrad Prebys Africa Rocks! 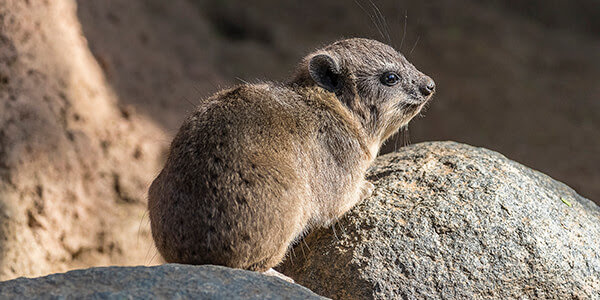 Four baby rock hyraxes are keeping their moms—and the keepers—busy as they learn the ropes (or rocks) about how to get around in their boulder-based exhibit. While rock climbing may seem a bit advanced for babies, rock hyraxes are more than up to the task: newborns are able to climb and run around a mere two hours after birth! Stop by and visit, and you might see them improving their climbing form or munching on browse. Check out the pups while they’re little—and don’t wait, because they’re growing fast. Don’t miss out on an evening of music, socializing, and animal friends—and a preview of Jungle Bells at the San Diego Zoo! On December 13, from 5:30 to 9 p.m., adults—ages 21 and up only—can visit parts of the Zoo, savor a complimentary beverage (choice of either one beer, soda, or water), talk with a keeper, hear from our researchers about conservation projects, meet some animal ambassadors up close, enjoy a variety of music, and more, for a special night of fun! 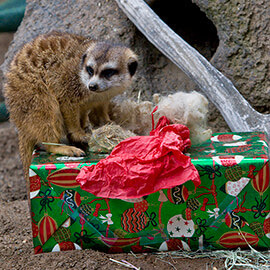 Reservations are required; purchase tickets online, at the Zoo, or by calling 619-718-3000. 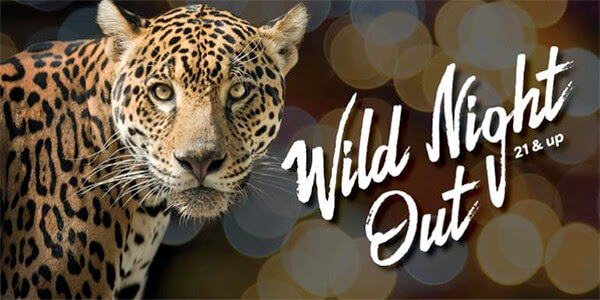 Price includes one welcome beverage voucher and admission to the event (including evening Zoo admission). Ready to go wild? Daily through January 6, you can meet master carver Rodolfo Garcia Velasquez starting at 11 a.m. at the Zootique as he intricately carves the lagenaria vulgarisgourd. The technique involves etching fine lines into the gourd, creating a series of drawings. A finished gourd might become a birdhouse, a bowl, a box, or even a basket—any of which would make a unique holiday gift. A world of exciting wildlife content is as close as your web browser! 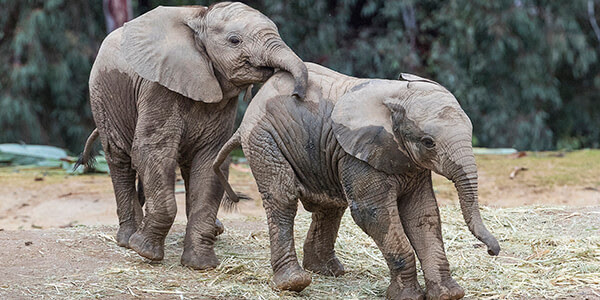 ZOONOOZ Online features articles about your favorite animals and plants, our conservation projects, what our keepers are up to, and even some “wild and fun” stories that will pique your interest for more. Take us with you—ZOONOOZ Online is mobile friendly, too. Check it out! You can be part of the solution for saving reticulated giraffes by helping us classify field photos collected at two conservancies in northern Kenya. Visit wildwatchkenya.org for a quick orientation and access to our photos from motion-activated cameras. 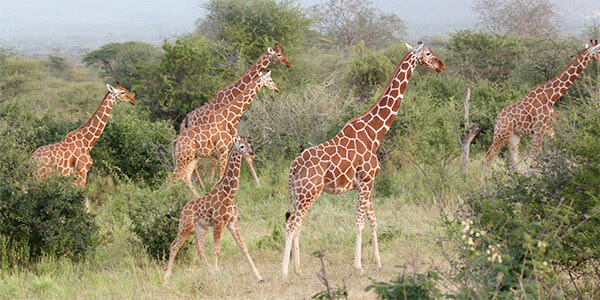 You’ll see the lion’s share of Kenya’s wildlife, including giraffes. 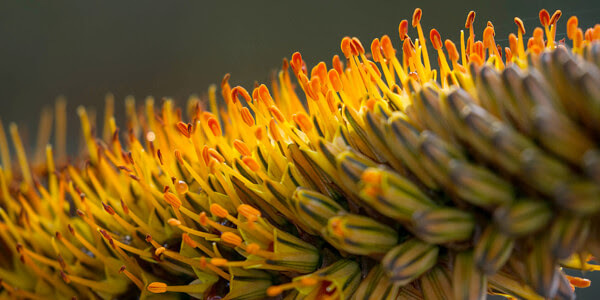 Our goal for this Wildwatch Kenya challenge is to classify this set of 256,700 images by the end of the year. Visit wildwatchkenya.org and become a citizen scientist today! 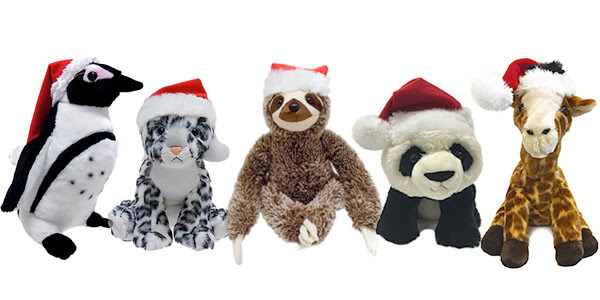 He may be crafted in the likeness of everyone’s favorite slowpoke, but our festive holiday sloth, the newest member of our Holiday Plush Collection, will win your heart in record speed! Priced at $19.99, he’s the perfect addition to your collection—check out the other styles, too. 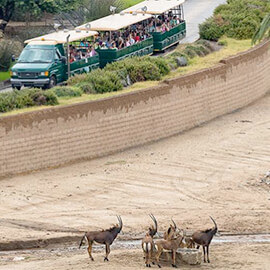 Gain insider access to all the San Diego Zoo and Safari Park have to offer! Treat yourself to free admission year round, plus shopping and dining discounts, invitations to member-only events, and more! 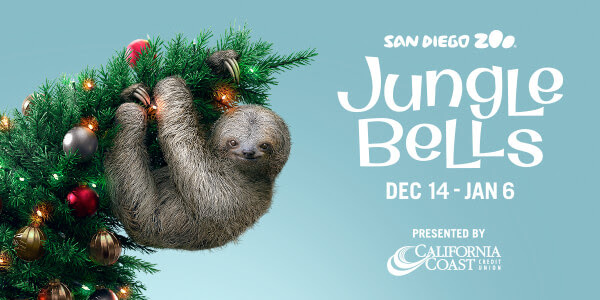 ‘Tis the season for festive fun at the San Diego Zoo’s Jungle Bells presented by California Coast Credit Union, December 14 through January 6, 2019. Animal-shaped light sculptures, festive decorations, holiday treats and entertainment, and fun animal experiences transform the Zoo into a wild, glowing wonderland. Santa will be on hand December 8, 9, and 14 through 25 to visit with youngsters, and some of his elves will keep things hopping with an energetic trampoline performance of the Toy Shop Hop. For another Santa-themed adventure, hop aboard “The Polar Express 4-D Experience.” Albert’s Restaurant is even presenting its own holiday spirit: Happy Holidays Happens, featuring drink and appetizer specials from 3 to 5 p.m. daily during Jungle Bells presented by California Coast Credit Union (except December 24). Start a new family tradition while making a difference for wildlife! On Friday, December 14 or 21, from 4 to 7 p.m., wear your PJs to meet animal ambassadors up close, and enjoy a delicious and bountiful “breakfast for dinner”—followed by special holiday activities, including hot cocoa and cookie decorating, making holiday gifts for your favorite animals, and taking photos with Santa himself. Then, embark on a decked-out holiday Africa Tram to sing animal-themed carols and hear stories about how we celebrate our animal family—just like you celebrate your family! Cost is $64.95 for adults, $44.95 for children ages 3 to 11; plus tax and parking. Nonmembers add Safari Park admission. Have some fiercely festive fun at the Safari Park, December 22, 2018, through January 6, 2019! From 9 a.m. to 5 p.m. daily, the Park’s Base Camp is ready for seasonal merriment, including strolling entertainment, animal presentations, cheery decorations, and, of course, visits with Santa (December 22 and 23). Have a holly, jolly, wild good time! Coca-Cola is proud to be the official beverage sponsor of the San Diego Zoo and Safari Park. California Coast Credit Union is local, not-for-profit, and committed to improving the lives of its members and others in the community. Become a member today.